When the Spot was built several natural problems were sculpted into the boulders. They’re all considered bounty problems–first ascents pay cold hard cash. Many have been sent, but a few remain to see a $ worthy effort. We will soon post the first ascentionists of the finished problems here, so you know what problems are still up for grabs. #1 Project – Standing start using both right and left aretes. Follow right arete to summit, dihedral to the right if off. #2 Book Mark (V4/5) – Sit start on the lowest holds in the dihedral. Follow holds in dihedral and on right arete to summit hueco. VARIATION (V5/6): Exit to the left at the top avoiding the the hueco and the jug at the top. #3 Project – Sit start same as #2 but immediately climb right across blank face to gain small underclings in the seam. Continue to the top avoiding the right arete. #4 Project – Same as #3 but start in low hueco that is at the base of the large runnoff trough and climb left to gain the underclings in the seam. #5 Downplay (V0) – Standing start, climb up the runoff trough through large huecos to the summit. This is also the easiest way down from the tp of the boulder. #6 Project – Standing start with both hands in the seam that splits the entire face under te large scoop. Climb left through scoop pockets to obtuse arete and use pinches/liebacks to gain the summit. #7 Crackle in a Blender (V7/8) – Sit start on lowest holds of right arete and climb left through underclings and straight up over cracked face to top. VARIATION (V5/6): Standing start on small underclings or jump-start to opposing sidepulls. 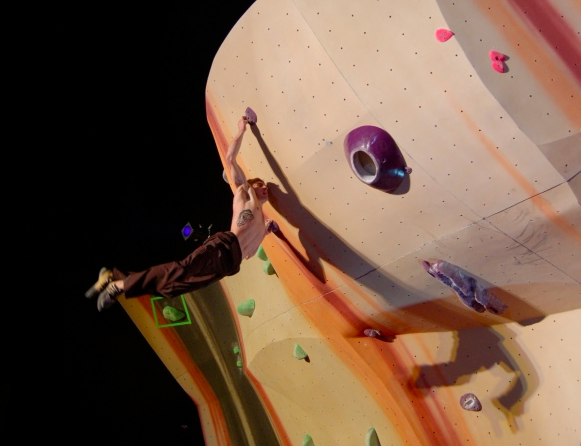 #8 Eruption (V6/7) – (FA Isaac Caldiero) Sit start on lowest holds of arete. Move up through 2-finger pocket and onto small crimps on slab and inside dihedral. Top out at summit of dihedral. #9 Attack of the Minions (V11/12) – (FA Daniel Woods) Sit start on lowest holds in corner scoops and climb up left arete and summit. VARIATION (Project): Same start, but summit to the right avoiding the left arete after the sloping sidepull on Attack of the Minions.